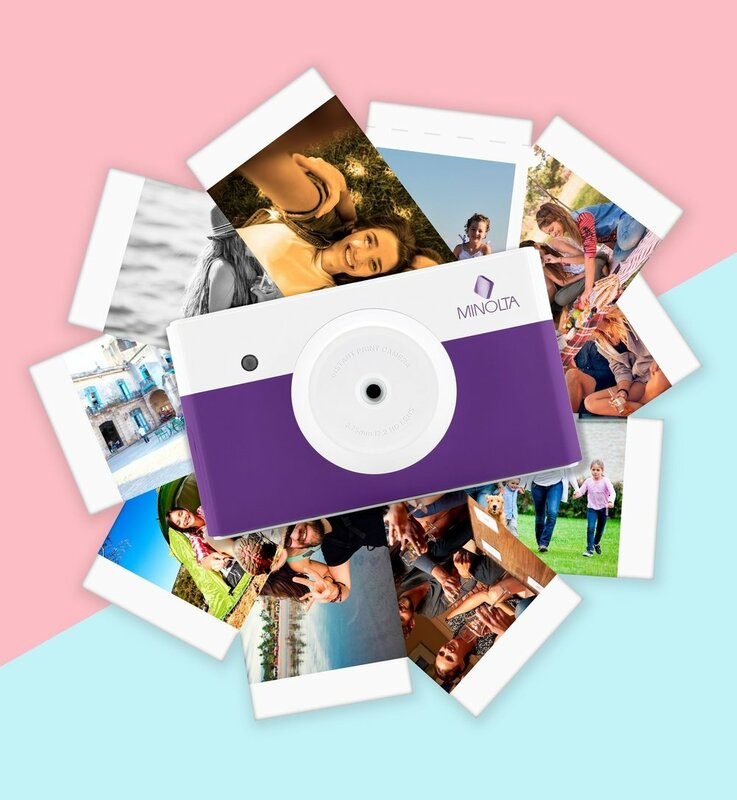 Break into a fun, new world with the instapix™ and experience all the classic features of an instant-print camera with all of the modern benefits. Digital upgrades like auto-focus, gamma correction and Bluetooth® allow you concentrate on the moment – and not on your expertise! Once your photo is captured, simply review your shot on the color LCD monitor or your smartphone, and decide whether to instantly print or shoot again. Featuring patented 4PASS Printing Technology, this 10-megapixel camera allows you to point, shoot and print lifelike credit-card-sized photos in just 50 seconds. Shots are printed in 16.7 million real colors with an extra added protective layer so memories last a lifetime. And the fun doesn’t stop there – using the built-in Bluetooth®, print any photo shot by your smartphone or send snaps back so you can edit and share on social media for all to like. 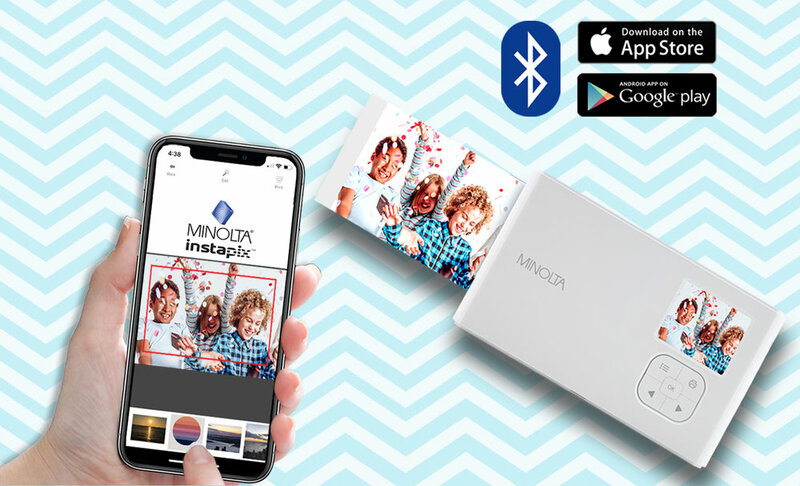 Break into a fun, new world with the instapix™ and experience all the classic features of an instant-print camera with all of the modern benefits. Digital upgrades like auto-focus, gamma correction and Bluetooth® allow you concentrate on the moment – and not on your expertise! 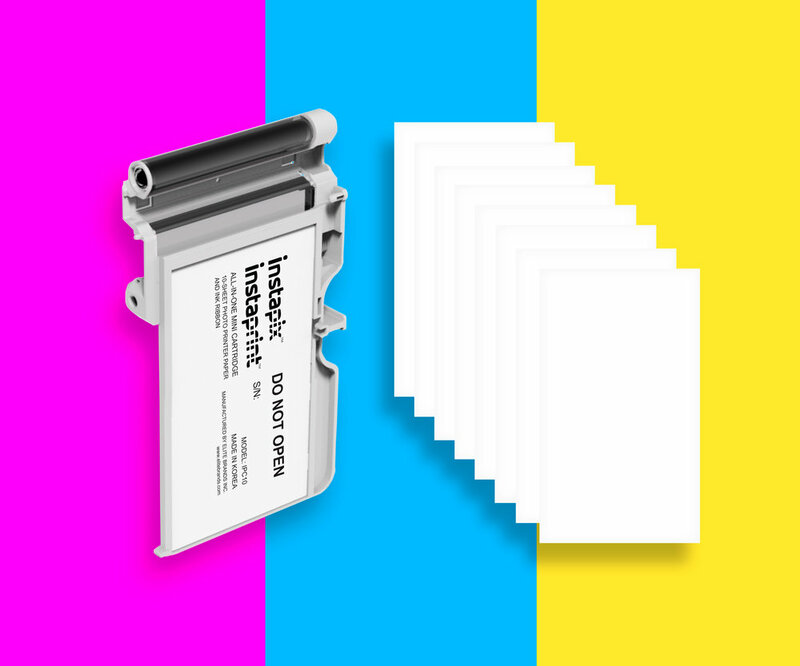 The 4PASS system for the instapix™ produces a color or black + white print at 2.1” x 3.4”, which is 30% larger than other instant print systems. 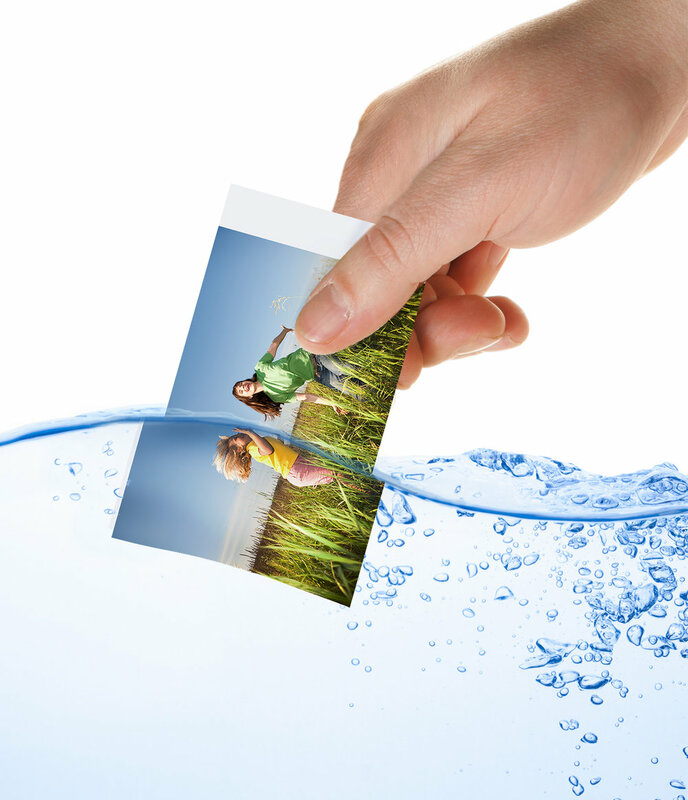 Photos are printed in less than a minute and are fully developed and dried instantly. Shots are printed in 16.7 million real colors with an extra added protective layer so memories last a lifetime. Because of the picture quality, a Minolta 4PASS photo can be enlarged to 4”x 6” or 6” x 10”. With some other technologies, photos cannot be enlarged because of low image quality or because the images are not retained after output from the camera. Featuring 10 mega pixels photo resolution for sharp photos, and a 1.7” LCD viewfinder to select photo style options, and see & print only the photos you like. Once your photo is captured, simply review your shot on the color LCD monitor or your smartphone, and decide whether to instantly print or shoot again. With instapix™, the cost per photo can be much lower because you can shoot and decide whether or not to print. With other technologies, the photo is printed immediately upon capture with no option for review. The printing technology, also known as dye sublimation, produces superb photos and seals each print with a high gloss laminate coating. The prints are durable, long lasting and waterproof. The final printout is smudge-proof and fingerprint-proof. With other technologies, the prints are not waterproof and will curl or smudge as a result of moisture or humidity. 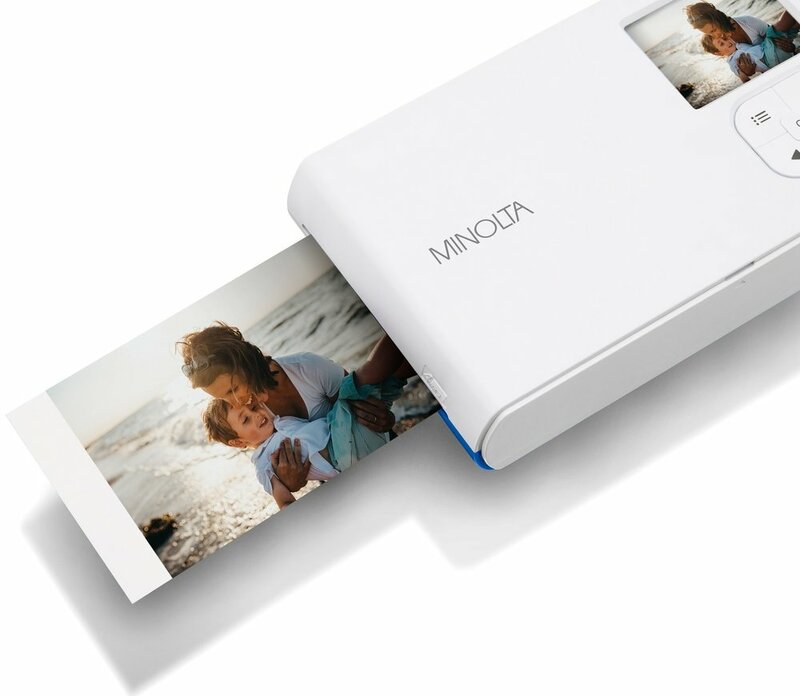 The Minolta instapix™ system allows you to enjoy the convenience of instant printing with the technological advantages of digital photography. Smart and flexible, it syncs with your smartphone via Bluetooth® and provides digital upgrades like auto-focus and gamma correction. 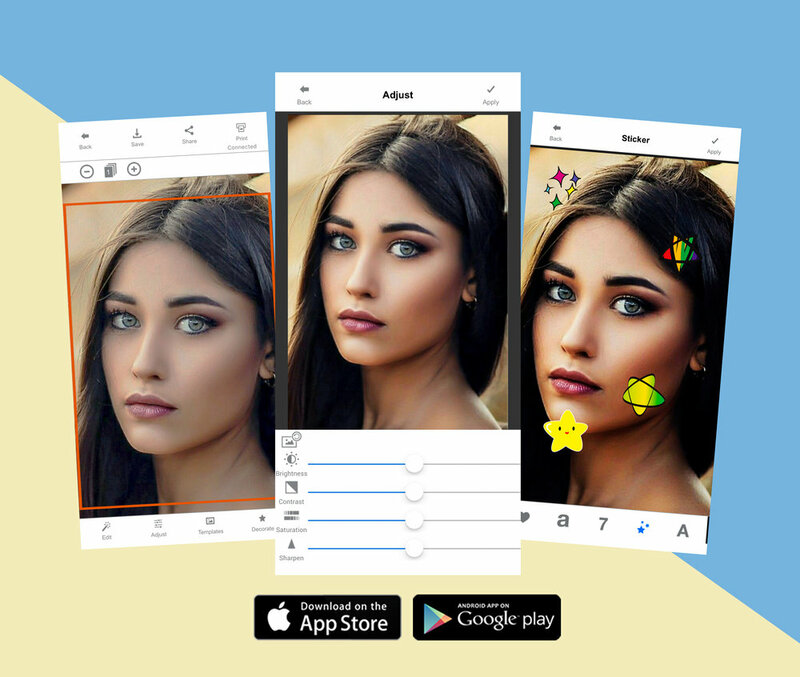 The smartphone app allows you to control your camera, remotely shoot from the camera and save photos to your smartphone, or send and print pictures that have already been stored in your smartphone’s photos library. Embrace your inner photographer and start snapping away. Load your all-in-one instaprint™ cartridge and shoot+print on the spot. Use the camera or easy instapix™ app to add filters, borders, ID photo, collages, stickers and more. Editing capabilities and options are endless. Perfect for printing selfies, portraits or landscapes. You can now share your creations online and on paper! It features the world’s smallest 4PASS all-in-one system for carrying convenience and unmatched quality. The things you carry represent you and all your uniqueness. The Minolta instapix™ now appeals to every shutterbug with a choice of 5 amazing shades of the rainbow. Capture your personality in charcoal, coral pink, blue, light gray, or purple. Weighing next to nothing, this camera is truly everything. Just slip it in your pocket, and print up to 20 photos per charge. Printed photos seem ancient by today’s technological world. 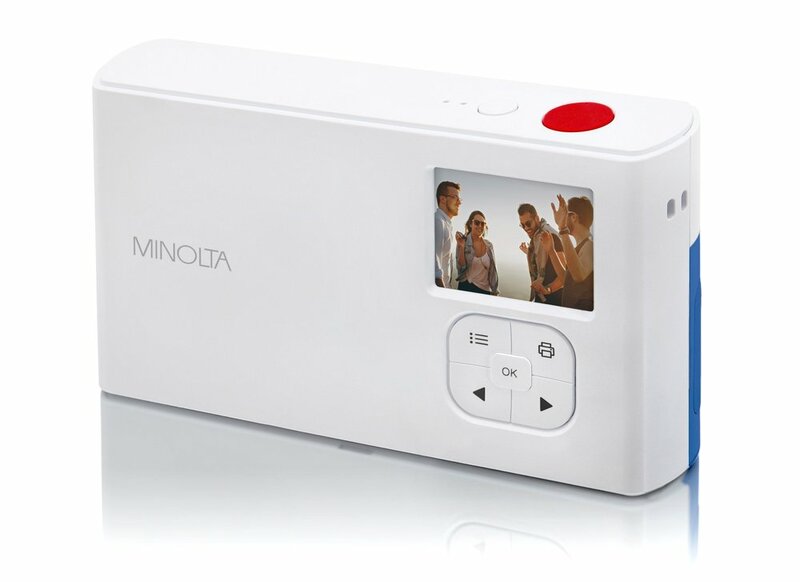 But now with the Minolta instapix™, you can shoot, print and share stunning photographs as fast as you take them! The compact but mighty instapix™ features multiple shooting modes, border options, a self-timer, different color filter options and other extras so you don’t have to think. No WiFi or Bluetooth® connection is required. Just shoot, print and share! 4PASS is a patented technology that uses dye diffusion thermal transfer (D2T2) technology that is a heat transfer process to distribute the yellow, magenta and cyan color dyes onto photo paper in a single continuous tone. It uses real film-type YMC ink coloring and a glossy laminating overcoat for the final pass. The result is a high-quality photographic output with 256 levels per color (total 16.7 million colors). Each color patch is directly adhered to the paper to reproduce the most similar color as the original photo was captured. The 4PASS technology has a much wider color reproduction range by using full temperature control range (0~300C) of TPH (Thermal Printing Head). This results in no fingerprints or smudging on the final print, and no cleaning of the print head is required. It uses the world’s smallest all-in-one paper and ink cartridges. With other technologies, colors are not as precise because of heated layers, bleeding and overlap. Simulated printing process of instapix™ 4PASS. Watch along as your instapix™ meticulously prints each layer of your photo. It first begins with a full layer of yellow, followed by magenta, cyan and final overcoat of laminate to seal and proof your photo print. Each color patch is directly adhered to the paper to reproduce the most similar color as the original photo was captured. Included at the edge of each printout is a detachable 0.4” blank white space for you to jot down a date, memory or fun phrase. The entire printing process completes in under 50 seconds from start to finish.